This morning a new baby boy has joined my brother and sister-in-laws family. It's always so exciting to have new babies and to give them new things. So this new baby boy is getting my newly finished quilt. I've decided to call it Sea Glass, because those colored fabrics remind me of of the green glass buoys everyone but me seems to have. And I want some! This time I machine appliqued with a blanket stitch instead of needle turn. I think I prefer the look of needle turn, but you can't ignore the speed of machine applique and the contrasting thread makes it interesting. I then decided to hand quilt everything else to make the quilt soft to wrap a new baby in. I love the ornate machine quilts, but there is something very... down to earth I guess about hand quilting. I hand quilted around each petal in grey to give some emphasis with the stitching. I love how the dotted line turned out, then used white for a more subtle approach for the background. So there you go, the newest project, Sea Glass, going to our new family member. We love him already. The pattern should take less than a year this time! Oh my, Patti. This is beautiful! This is beautiful! I can't wait to make it! Just bought the pattern today! I love these fabrics! 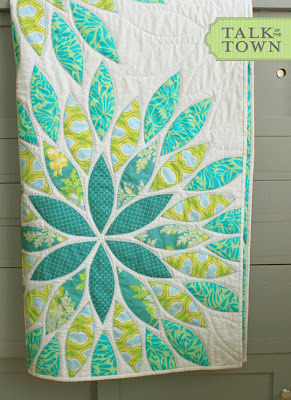 I've been wanting to make a quilt for my bedroom in shades of turquoise and yellow, do you mind sharing what you used here? 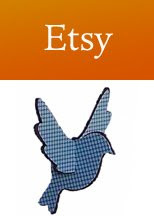 Hi I have purchased this pattern on Craftsy. I found three of the four fabrics but need some of the center dark turquoise from George Courey. Do you have any idea where I could find this fabric? Thank you so much! Hi there. I just purchased your Sea Glass pattern (just love it!, I have a query - do you need to use a walking foot while doing the blanket stitching around the appliqué? I used a walking foot. I'm not that skilled in the free motion quilting department. Ha! 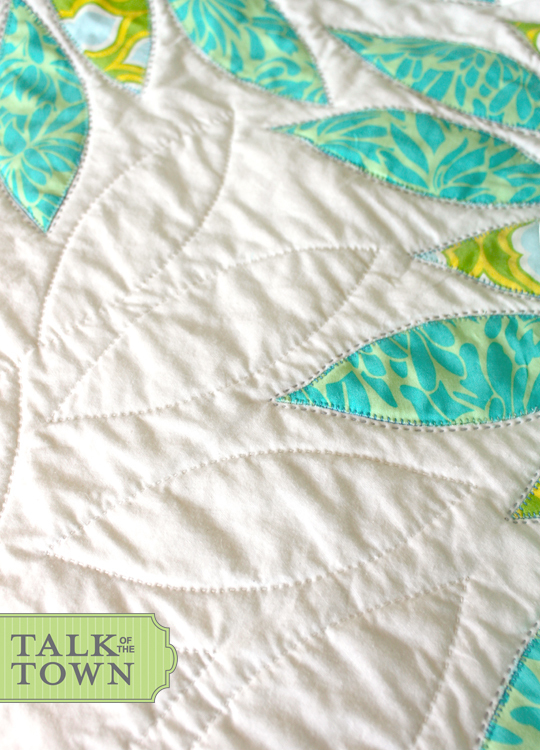 Did you use steam-a-seam on the applique? If so, does it make it stiff? I did use a fusible web product on half of the appliqué, lapel glue on some, pins on others. I was experimenting. I didn't notice that the fusible web made it too stiff. The blanket still felt nice. 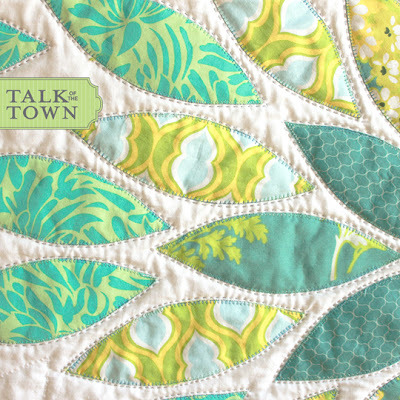 Your quilt is very beautiful the colors are outstanding the way it all came together. Great Job. I love this! Beautifully done in every respect. Is it raw edge appliqué of did you turn it by hand before machine blanket stitching? It is raw edge. But I encourage everyone to do what they are comfortable with. Love this quilt it's beautiful. What fabric did you use? George Courey Brook Impression Turquoise. 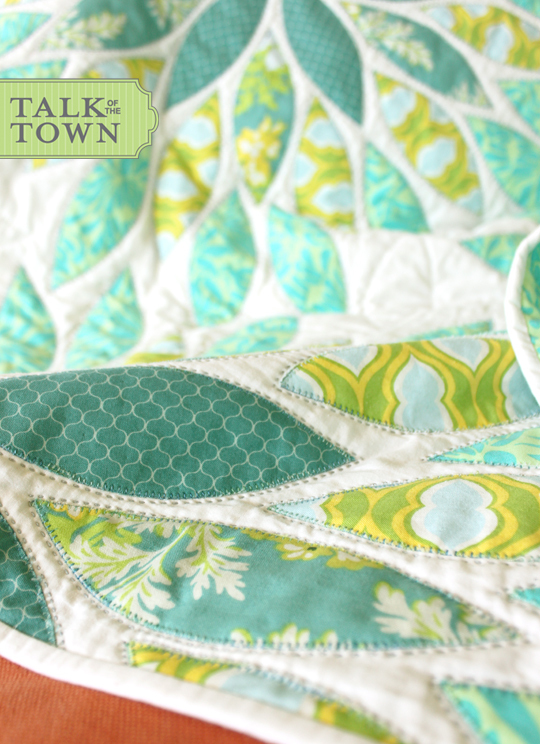 I can't find this last fabric anywhere online so just choose a more monochromatic turquoise. I have just purchased this pattern. My daughter is wanting this to be a king size quilt. Has anyone made this in a King? If so could you please let me know how much fabric you got. Is the king version made in sections or are you appliqueing onto a whole cloth?? Yes, I like to use a whole cloth and the direction are for that. 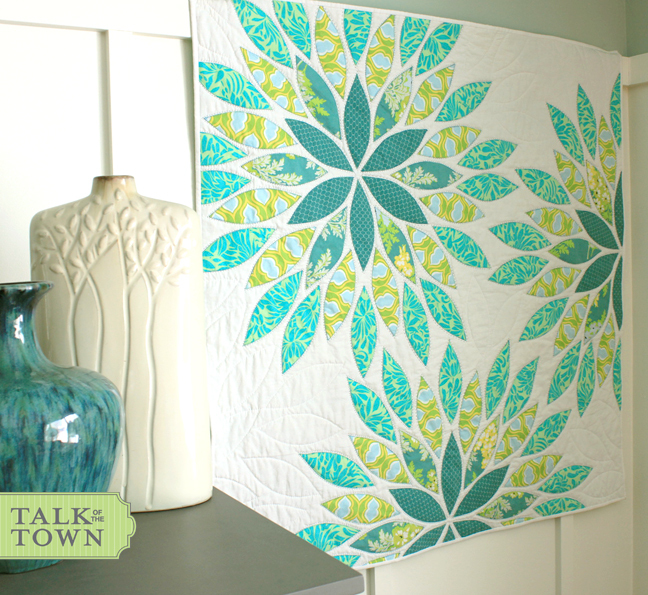 However, you can totally piece together your own backing before you apply the petals. I have done that as well.